Today’s story takes a look at Stirling’s lost industrial past and the workforce of the Forthbank Carpet Works. The workers are mainly women who were weavers and bobbin winders. Most lived in Raploch and walked to work every day. 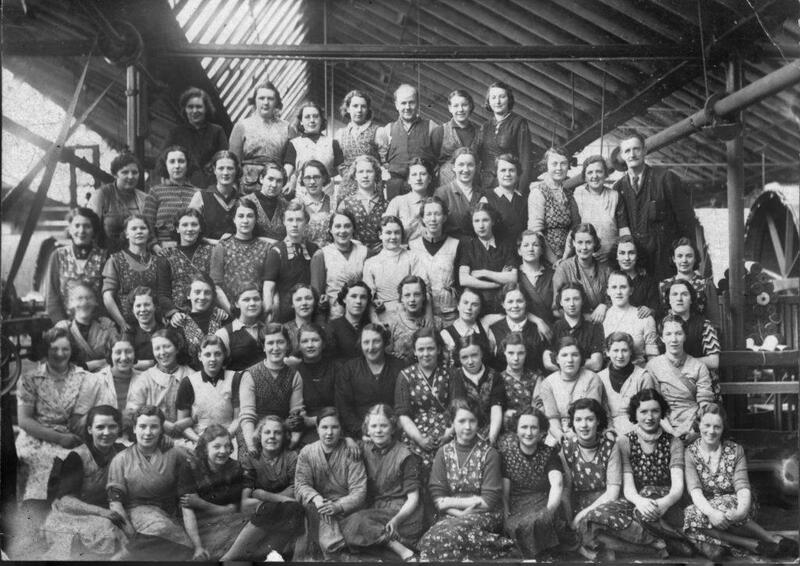 Note the brightly patterned cross- over ‘peenies’ or aprons which was the common dress of factory workers and housewives alike, in the decades before and after the Second World War. The photograph was gifted to the Stirlng Smith by Dorothy Hayes. Thanks to the survival of a company cash book and ledger of Thomas Gilfillan in the National Library of Scotland, we know that Scotch carpet weaving was a flourishing industry in Stirling in the 1760s, with many local weavers engaged in the business. In Glasgow, James Templeton took it to an industrial level, and his carpet factory on Glasgow Green was famously fronted in coloured brick work, in imitation of the Dodge’s Palace in Venice. The Templeton disaster in Glasgow, 1889, when 29 women were crushed to death through the fall of the brick façade led to a concentration on safe building practices. This Templeton building in Stirling is so strong that it still stands as the home of Stirling Enterprise Park today, nurturing new businesses. Is the building referred to here, not in fact the old John Player’s cigarette factory ?? Yes you are right it is the John Player Building, now home to Step Stirling.